Top row (left to right): 1. John Mihoevich, 2. Debbie Alviso, 3. Steve Carlsberg, 4. Maia Khan, 5. Kenneth Babbitt, 6. Linda Elkin, 7. Russell Kransky, 8. LeAnn Beggs, 9. James Parker. Second row: 1. Richard Wasley, 2. Kimberly Sutter, 3. Wylie Fabyan, 4. Laura Cassell, 5. Ty Steers, 6. Donna Friesen, 7. Kenneth Peterson, 8. Robbyn Cerruti, 9. Robert Terhune. Third row: 1. David Thomas, 2. Jerie Sandholtz, 3. Richard Ludwig, 4. Staci Hudson, 5. Pamela DeStigter, 6. Kathy Zurakowski, 7. Jeff Norris, 8. Kimberly Minor, 9. Harold McCallister. Fourth row: 1. no picture, 2. Mr. Donald Hubbard, 3. Libby Cecil, 4. Paul Olson, 5. Diane Schweiger, 6. Allison Anderson, 7. Elizabeth Bell, 8. 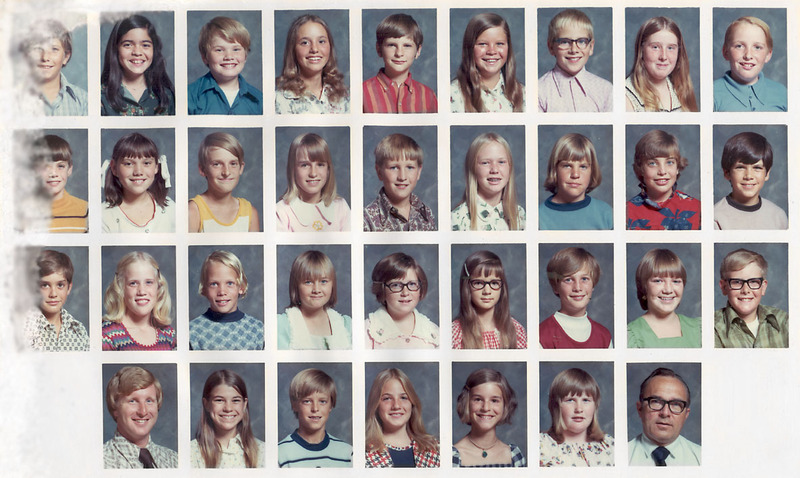 Mr Donald Larsen, 9. no picture. Credits: From the collection of Laura Cassell. Laura's picture has suffered some water damage on the left (which I have blurred to minimize the distraction). If you have copy of this picture that is in better condition, please scan it for the archive.